The preparation of the colors and their use is very simple. It takes only a few empty containers used for mixing the colors. As a binder is used, for example glue. Take one level tablespoon of pigment and mix it with the appropriate amount of glue. To have an optimal color for painting, it is necessary, pigment and glue mix intensively. The more glue is used, the brighter the colors. Of course, the colors blend well with each other (see color table). If the mixture is too thick, it is advisable to attach a little water gradually until you reach the desired consistency for painting. With the coarser soil particles can be interesting effects: Spread the drawing paper with glue (thin layer), and then sprinkle the coarse soil particles over it. After the glue has dried, the excess soil particles can be removed with a brush. Another creative option is the use of natural materials. Freshly picked plants can be preserved with varnish and thus maintain their original color. Dried leaves can also be processed directly. To work is the best one bristle brush. After painting this must necessarily be carefully cleaned, as it otherwise bonded. The dry season is approximately one hour! The dark color indicates a high proportion of humus in the soil. Humus is organic material from dead plant parts, composed of dead organisms and their conversion and degradation products. 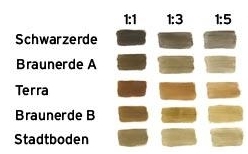 Those in the brown earth soils A and B dominant yellow-brown earth, brown or orange colors are caused by, in the soil in various mineral forms abundant iron. The more orange the soil is, the higher the proportion of iron oxides. The mineral was 1806, in honor of the German poet Johann Wolfgang von Goethe, goethite, named, as Goethe was also an avid mineral collector. The red colors in the soil are also present in the soil caused by the iron. However, results from a warmer climate and less water in the soil one other mineral form of iron oxide - hematite. As the red coloring mineral hematite is very stable, such a base in Central Europe represent a relic of the subtropical to tropical climate 60 million years ago. What are the characteristics of the soil? The humus forms, with the mineral components in soil stable aggregates, which are a very good soil structure for crop growth. Furthermore, can save a lot of humus and release nutrients to the plants. The black color absorbs the solar radiation and thereby accelerated, especially in the spring, the growth of crops. Depending on the thickness can vary fertile brown soils. Fine sediments such as loess, a very good source material make for fertile soils. The location of the land in the city but that it is not used as a field site, but serves as a parking lot and built. At what depth you will find the material? Dead plants are converted into humus at the surface, so the top inch (the top soil horizon) are dark in color mostly by higher humus shares. The weathering of iron found in the humus-horizon at a depth of about 10 cm instead of - 20. However, this is strongly influenced by parent material, the use and power of the A-horizon dependent. The weathering of iron is in the B horizon at a depth cm instead of from about 10-20, even if the material were already millions of years ago (Tertiary). There's been in the city of humus was often lost or removed, the bright material is from a few cm deep.